important type of marine grass. 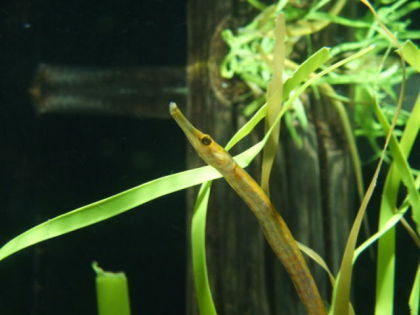 Eelgrass and other sea grasses are vitally important to the Earth because they store as much as twice the amount of carbon as the world's forests. This helps offset the amount of carbon dioxide produced by humans. Meadows of eelgrass in shallow waters also provide habitat for different species of fish and crabs, as well as a food source for ducks and manatees. The seeds of these grasses can survive passing through the digestive systems of some of these creatures and still be viable to germinate once they have been pooped back out. This allows the seeds to hitch a ride into further flung areas of the ocean to maintain and spread its range. A study of the spread of marine grasses published recently in the journal Marine Ecology Progress Series. The study looked at just how these animals aided in the distribution of the seeds. For example, they discovered that the lesser scaup, a type of diving duck, can transport the seeds up to 12 miles away. The researchers were surprised that one species of fish was among those redistributing the seeds since it is known to have a digestive system that can handle destroying them. It is hoped that the results of this study will help return the grasses to the bays along coastal Virginia. The grasses were almost completely wiped out back in the 1930s after an outbreak of wasting disease followed by a devastating hurricane. The result was the loss of bay scallop beds which had once been a significant part of the local fishing economy.